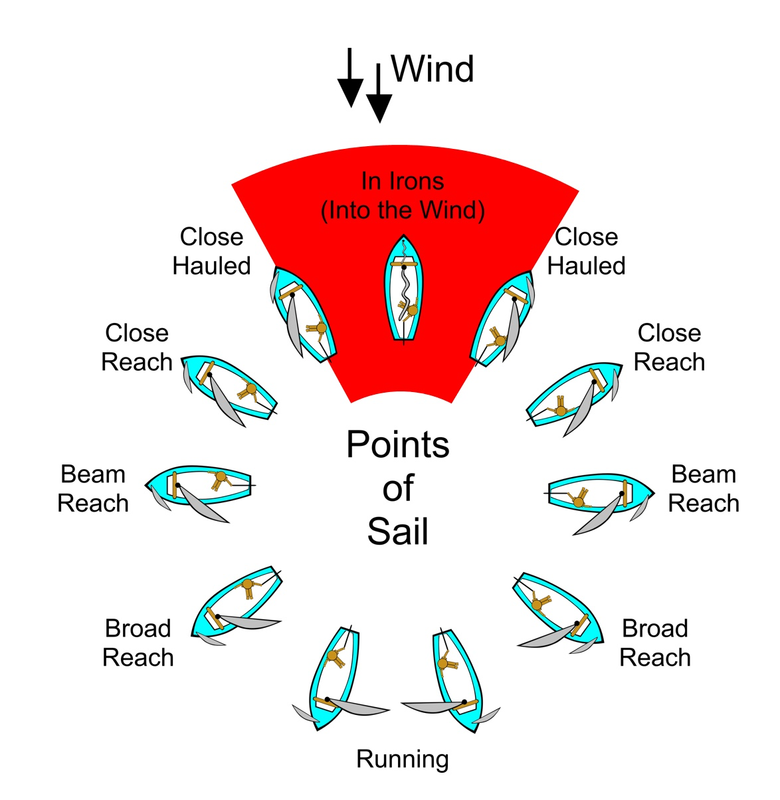 One of the first things you need to know when sailing is where is the wind coming from as this influences where you can sail and how tightly you need to pull in the sails. In general, the closer to the wind you are sailing (e.g. close hauled), the tighter the sail(s) need to be pulled in. In a boat with centre boards these also need to be fully down for close hauled, part way up for a reach and most of the way up for a run. 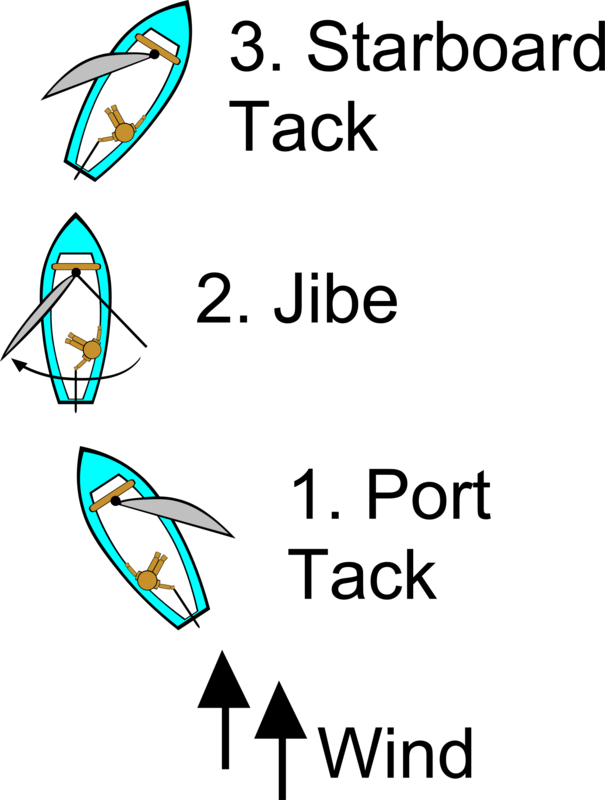 For beginners a beam reach, which is sailing across the wind, is the easiest point of sail to start out on as you are unlikely to accidentally either tack or gybe. The red zone (heading into the wind) is also known as the “No Go Zone” as you cannot sail in this direction. If you try, you will get stuck “in irons” and go nowhere. To head upwind you will need to sail as close to the no go zone as you can and tack across the wind to change direction so that you go in a zig zag movement towards your destination. When you tack you are moving the bow (front) of the boat through the wind. In the process the sail(s) swap from one side of the boat to the other, and you swap sides too, so as to balance the boat. 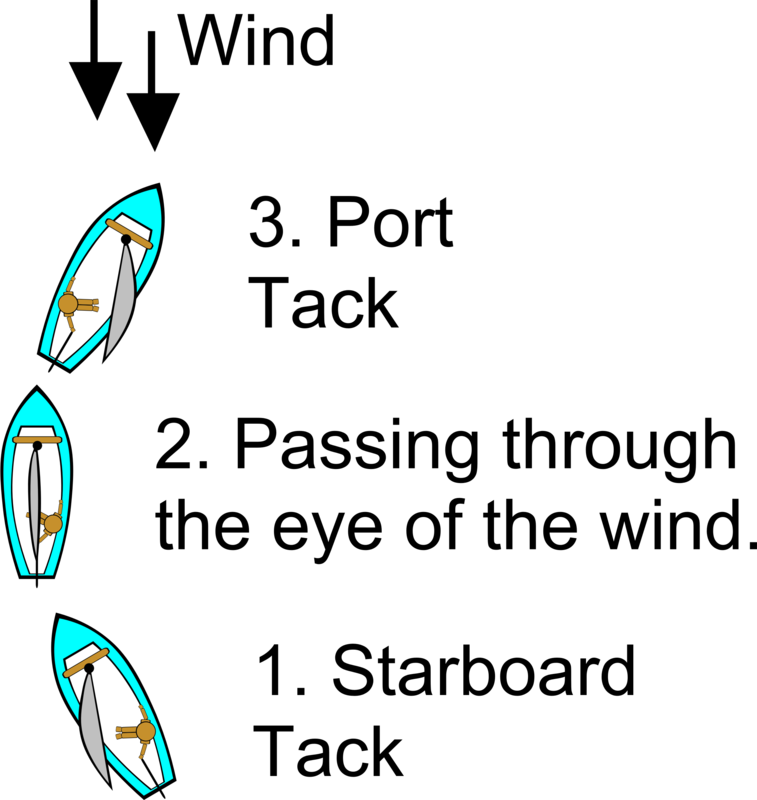 You need to be moving forwards with some speed to be able to tack so that the boat keeps moving and turning through the wind without stalling. To tack you push the tiller away from you. When you are going downwind ( e.g. on a broad reach or a run) and you need to change direction it is more common to jibe instead of tack. When you jibe you move the stern (back of the boat) through the wind instead. To jibe the boat you pull the tiller towards you and be ready to mind the main sail (and boom if there is one) as it crosses the boat very quickly.